Last week was a week of three different performances demonstrating the variety and our versatility in the events we now do. On Tuesday evening 11th August we held our first outdoor concert on the new decking down at Saundersfoot harbour which proved to be a really good venue with a large audience. People were not only on the decking itself but also around the railings of the harbour in a sort of amphitheatre scenario. 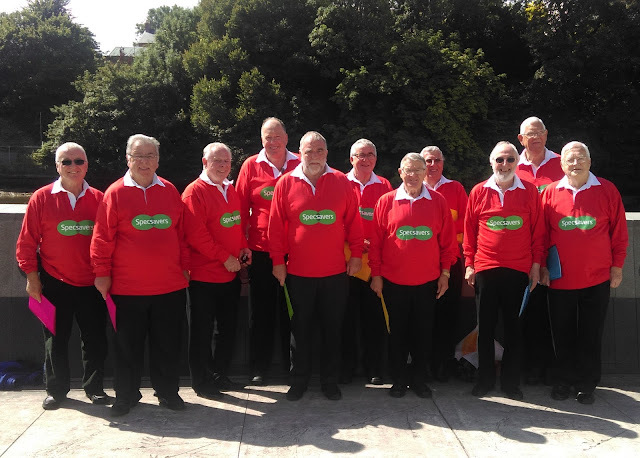 Then back to formality on Thursday at St. Mary’s church for a concert in aid of the Red Cross and then on the Saturday, 12 of the choir took their turn in a series of “a capella” performances we are doing as “the Specsavers choir” in aid of the Welsh Deaf Rugby Union cause. 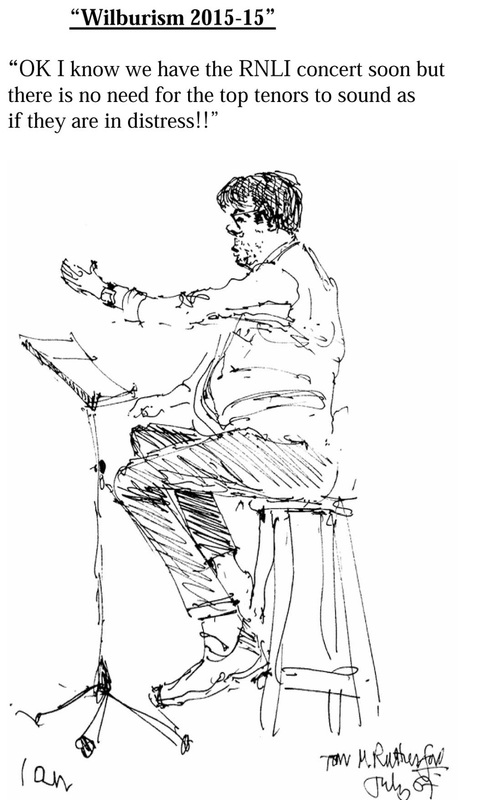 This one took place in Cardigan with the next one being in Haverfordwest tomorrow (Saturday). The point is often made that singing can be good for your health and wellbeing so it was good to see a few faces from the Saundersfoot medical centre in the audience for the concert which took place on the new decking at Saundersfoot harbour. Perhaps the message could go back to recommend prescribing “singing to be taken with a glass of liquid twice a week”. Choir founder member Tom Pearce can be seen with the lovely background of Saundersfoot harbour. The Red Cross concert was once again enhanced by trumpet soloist Corey Morris accompanied on piano by Dr. John Harrison BEM, organist of St. Mary’s church. Corey’s performances are always well received by the audience. His command of the instrument on both classical and lighter melodies is very enjoyable. You just know that people are singing the words to themselves when they hear such lovely songs as Over the Rainbow, My Way and What a Wonderful World. There is no let up next week. As mentioned above we will start the week’s programme as “the Specsavers choir” in Haverfordwest on Saturday morning 22nd August where we will begin singing outside the Specsavers shop in Bridge Street. Specsavers are the sponsors of the Welsh Deaf Rugby Union. Then if the weather is good enough on Tuesday evening we will be outdoors again but this time at the entrance to the harbour in Tenby and then back at St. Mary’s church on Thursday for a concert in aid of RNLI. The lifeboat service operating from Tenby is one of around 200 in the British Isles and there has been a lifeboat station here for over 160 years. We are always glad to do concerts in aid of charities but I think there is a particular association with this very worthy cause which deserves the maximum support. So please come along if you can.